Have you ever experienced neck and back tightness after staring at the computer screen for too long? You may even experience headaches or shoulder pain as the work day continues. What should you do? You have to MOVE. I am often asked ‘What is the optimal posture for me at work?” It seems everyone has difficulty with sitting properly at work. This problems has evolved from the need to be in a sustained sitting position in order to keep up with work job tasks. Despite advances in technology and workplace health and safety, there's one component which has not changed. People just aren't moving enough. We insist on remaining still for extended periods of time and we're not designed for it. We're made to move. It does not matter if you're sitting or standing. It doesn't matter which position you try. There's a cumulative effect as well. The load on your spine will grow during the day. The soreness will come on earlier and earlier in the day as the week goes on. And of course, over the weekend, you may feel amazing since are probably moving properly again. One of the very best ways to get started is to begin with a small number of regular moves and stretches you can perform while sitting or standing at the desk. They are also wonderful for those of you who travel by air and are stuck on airplanes routinely. 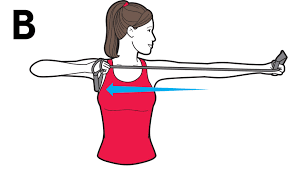 One of my favorite exercises, and one of the easiest ones to perform, are the “Bow and Arrows”. While sitting, imagine you are drawing back on a bowstring, like an archer. It will just take 30 seconds. This can get the chest muscles, the shoulder muscles, upper back muscles and neck muscles moving. And the great thing is, you do not have to leave your seat or workstation. Later on you can try it with some resistance. Learn more about healthy postures and reducing strain at work bylicking HERE. To learn more about back pain and disc problems click HERE. Our physical therapists in Mount Prospect have provided orthopedic rehab for 17 years. Contact us today to see to learn more about our services.